There’s nothing quite like annual plants to provide all-season color in your containers and landscape. 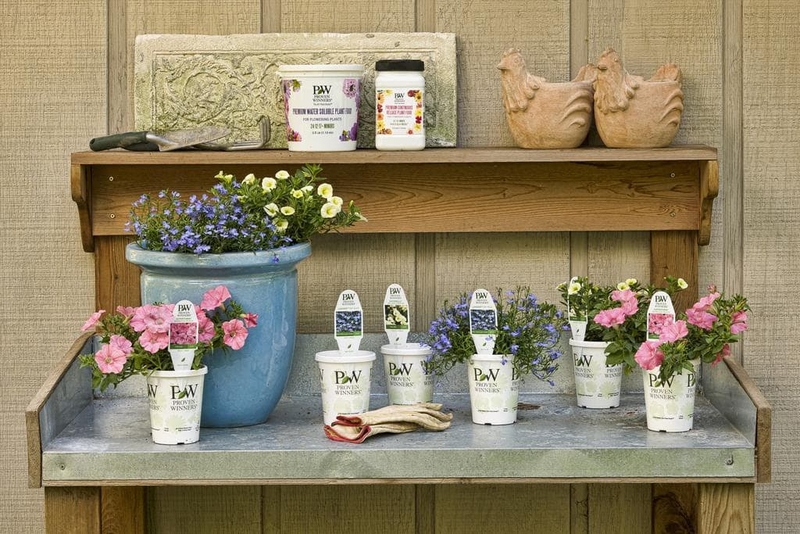 We are proud to offer the full line of Proven Winners annuals, along with a few additional popular varieties, which have been trialed and selected for their excellent garden performance. Are you looking for annuals to grow in containers or in the landscape? Will your annuals be growing in sun or shade? How often will you be able to water them? Can you commit to feeding your annuals throughout the summer? Which colors would you like to decorate your garden with this year? Containers v. Landscapes - Generally, larger sized annual plants are most often grown in landscapes or large containers. Smaller sized and trailing ones are typically grown in containers. Bedding plants, tropical vines and annual ornamental grasses are grown in both containers and landscapes. Sun v. Shade – Before you buy your annual plants, decide where in your garden you plan to plant them. Is that location mostly sunny or mostly shady? Choose varieties that prefer those conditions using our handy search tool. Don’t skip this step! It’s an important one. Watering Your Annuals – How often you will you water your annual plants? If you have a drip irrigation system like WaterWise® or plan to water by hand every day, you might choose annuals that prefer moist soil like these. If you don’t have much time to water, tend to take weekend trips in summer, or plan to skip a few days of watering here and there, you’d be better off choosing annuals that prefer dry to moderate soils like these. Feeding Your Annuals – All annual plants grow and bloom better when you feed them, but some are hungrier than others. 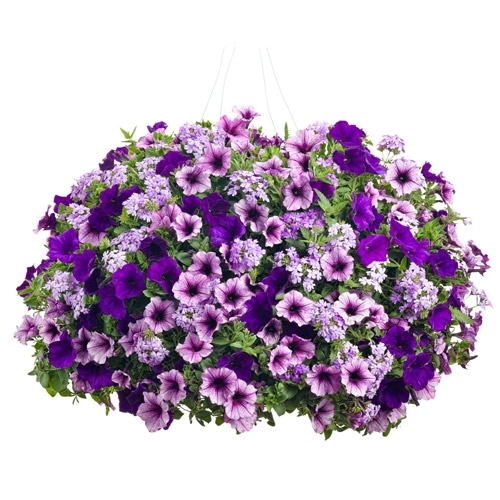 If you love the bountiful blooms of Supertunia® petunias and Superbells® calibrachoa, plan to feed them with water soluble plant food every third time you water. Most annual plants that are grown for their flowers like to be fed regularly since it takes a lot of energy to produce all those blooms. Annuals grown mostly for their foliage, like coleus and ornamental grasses, typically require less feeding. Which Color Suits Your Style? – Name your favorite color and there’s surely an annual to match! One of the most wonderful things about annual plants is that they come in every color of the rainbow. 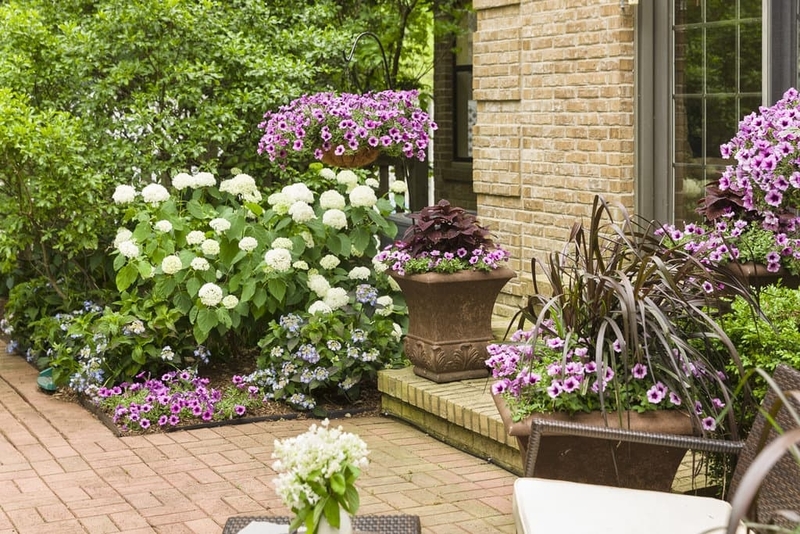 Whether you’re looking to create an energetic space with vivid colors or a calming one with cool pastels, it is easy to accomplish with annual plants. Search for annuals by color here. If you’ll be growing your annual plants in containers, the amount you’ll need depends on the size of your container. 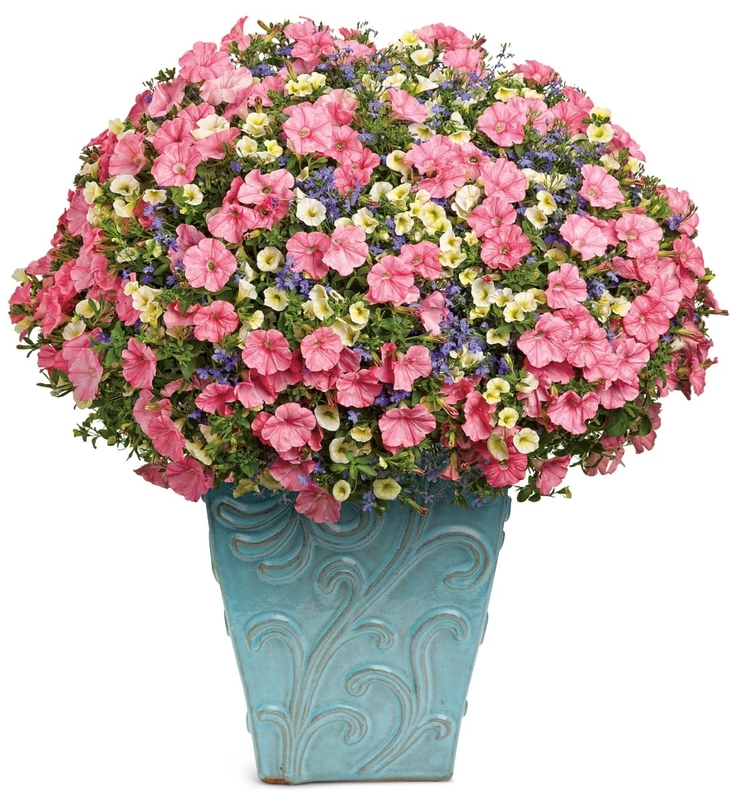 Generally, a 12-14 inch container (measured across the top) fits five 4½ inch potted annual plants. If your container is smaller or larger than this, adjust the number of plants up or down as needed. 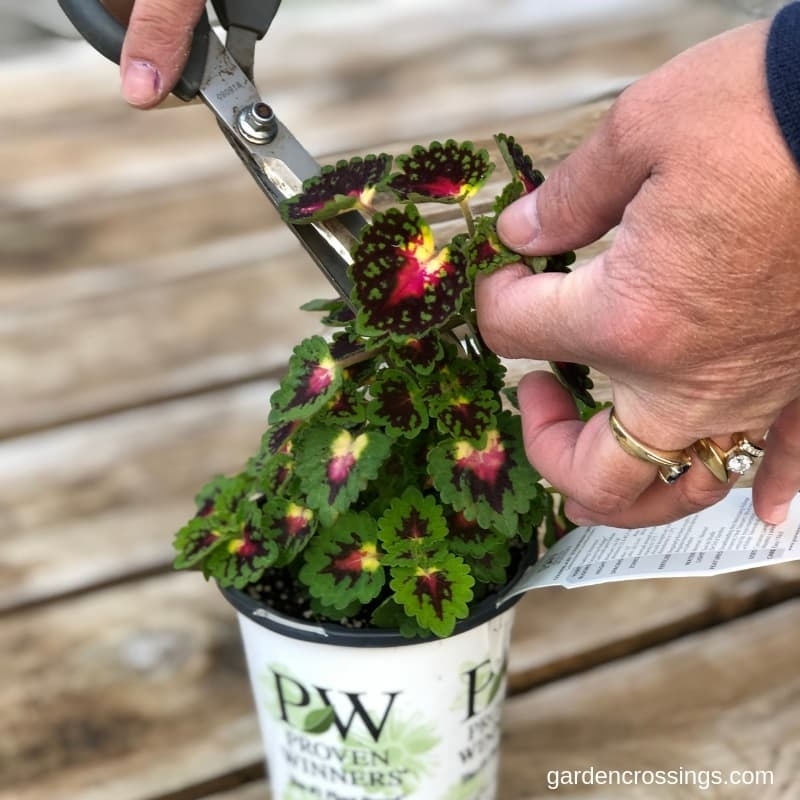 We’ve made it easy to purchase the proper number of annual plants for your containers by offering DIY annual kits and pre-planted annual combinations. 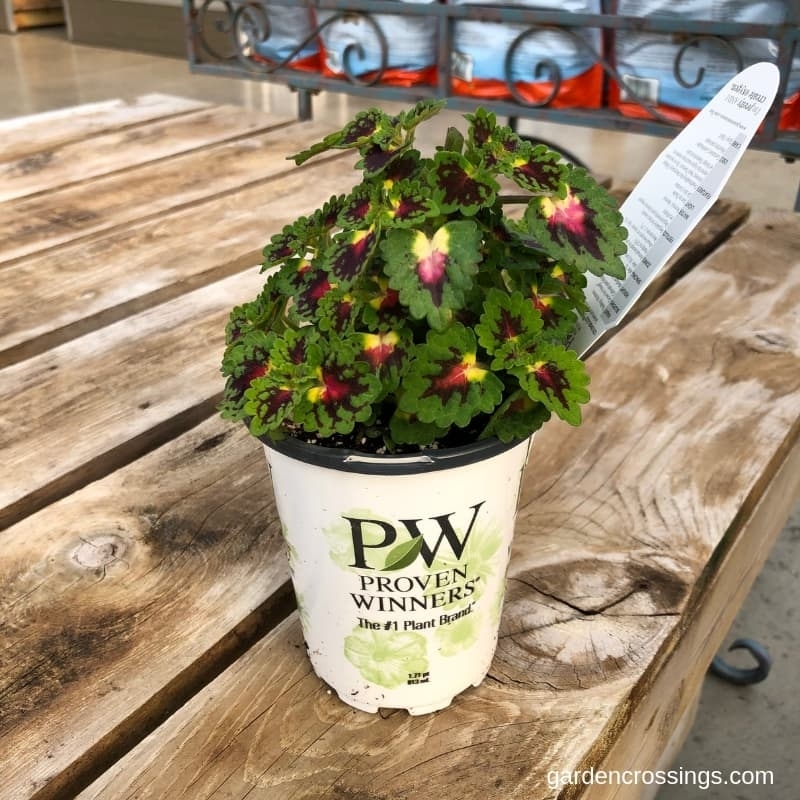 Take a look at them for inspiration before you put together your own container recipe or let us do the work for you by purchasing one of our pre-planted combinations. If you plan to grow your annual plants in the ground, you’ll want to consider how wide each plant will grow and if you’d like them to grow together to form one solid mass of color. Take note of the spread listed with each plant on our website. If a plant’s spread is 1-2 feet, position each one 1-foot apart if you’d like them to overlap or 2-feet apart if you don’t. You could also use this handy plant calculator tool to decide how many plants you need to fill a garden bed. Note, the “average distance between plant centers” in this calculation is the plant’s spread. Handling your plants correctly the day they arrive is a critical step in their success. Here are five steps you’ll want to follow as soon as your plants arrive. Open the shipping box immediately, take the containers out, and carefully remove all of the packing materials. Be careful not to tip the containers over too far or some of the soil will fall out. If it does, gently scoop it back up and press it back into the container. If your plants feel light for their size and the soil feels dry to the touch when you poke your finger down into it, water your plants thoroughly. Plant your new annual plants within three days of receipt if possible. If you need to wait to plant, set them in a bright spot outdoors that is protected from harsh winds and afternoon sun until you can plant them. If it is still too cold to plant outdoors when you receive your shipment, it’s OK to keep your annuals indoors near a bright window for a short time until they can be moved outside. Most annuals grow best in rich, loamy textured, well-drained soil. That’s why they grow so well in containers filled with potting soil. If you plan to grow your annuals in the ground, you’ll likely need to amend the soil first to provide the necessary nutrients and environment for them to thrive. If you have heavy clay or rocky soil, till in compost, shredded leaves, peat or aged manure to lighten up its texture and improve the drainage. Some people who have these conditions choose to build raised beds and fill them with good quality garden soil for growing annual plants. 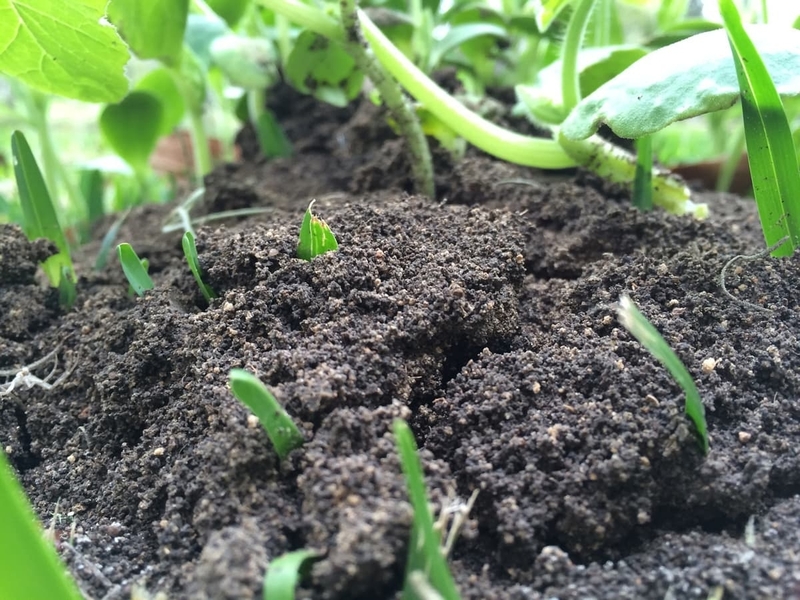 If you have sandy soil, you’ll also want to add compost, peat or manure to improve the nutrient quality. Sandy soils are very well-drained, so the concern will be keeping your plants from drying out too quickly. Adding those natural materials will help the soil retain more moisture. Regardless of your soil type, it’s a good idea to mix in some continuous release plant food when you plant your annuals. Always follow package instructions for rates. This kind of fertilizer is activated by heat so as the ground warms up, it will start releasing its nutrients for your plants. After you have planted your annuals, mulch around them to help the soil retain moisture and reduce the opportunity for weeds to grow around them. Take care not to let the mulch touch the base of the plants, as that can cause them to rot. Growing annual plants in containers is the easiest way to go since you can provide just the right kind of soil, moisture and nutrients they need. 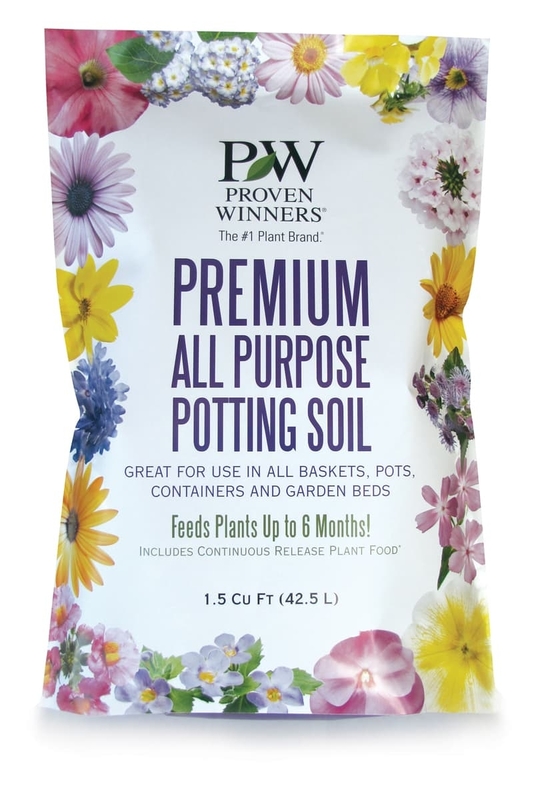 We recommend Proven Winners premium quality potting soil, which is a professional grade blend of peat moss, soft wood bark and perlite. 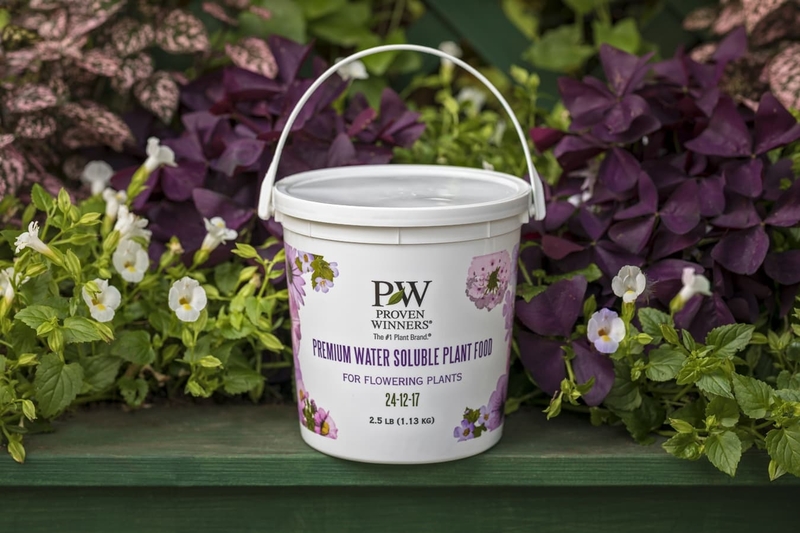 This lightweight potting mix works well for growing all kinds of annuals, perennials and shrubs in containers. Many people ask us if they can reuse the soil in their containers from year to year. While it’s not the best practice, you could reuse the soil but at a minimum, add continuous release plant food before replanting. Its components break down into finer particles the older it gets, which reduces its ability to drain well. Nutrients leach out of the soil every time you water. By the end of the season, they are mostly gone, leaving nothing to feed your plants next year. Soilborne diseases can carry over from year to year, potentially infecting your new plants. It is also common practice among some gardeners to fill the bottom half of their containers with stones, pot shards or some other filler material to save on potting soil. We do not recommend doing this because it simply is not good for your plants. If you could see inside the container, you’d notice that the roots continue to grow down into the filler material where the water pools instead of draining freely out the hole in the bottom. Eventually, this leads to rotting roots and disease issues. It is better for your plants to fill your container fully with potting soil to give them the space they need to spread their roots and grow to their full potential. This is especially important for plants with large root systems like perennials, ornamental grasses and shrubs. If you are using a very large container—20 inches or greater across—to grow annual plants, you could use a planter insert like this to reduce the planter weight. Check the soil moisture of your potted annuals before planting. If they feel very dry, water them thoroughly and wait at least 15 minutes before you work with them. Moist plants transplant with far greater success than dry ones. Check the bottom of the decorative container you plan to use for your annuals. Is there at least one drainage hole in the bottom? If not, you’ll need to drill one or choose a different container that will allow for drainage. Fill your container almost to the top with good quality potting soil. Leave about a one-inch gap between the top of the soil and the top of the container to allow room when you water it. 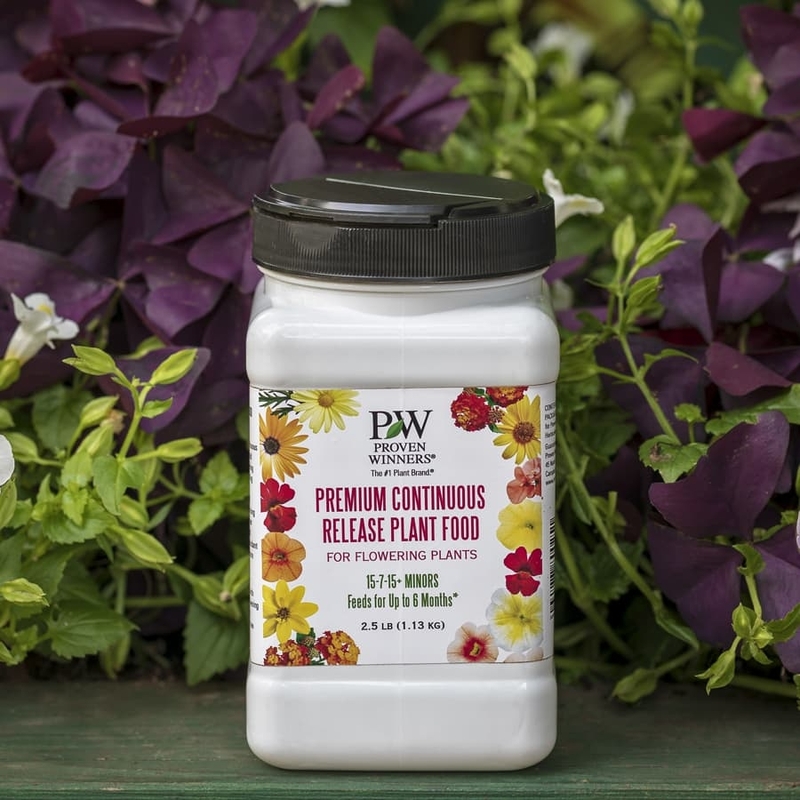 Mix some continuous release plant food into the soil, following package instructions for rates. Sprinkle some water onto the soil to moisten it lightly, mixing it with your hands as you go. Test out your arrangement by setting your potted annual plants on top of the soil to make sure there’s enough room for them all. Rearranging now is quicker than waiting until after you plant. It’s easiest to start by planting the middle plant first, then work your way around the edge to fill in the rest. Squeeze the pot gently to loosen the roots’ grip. With your hand over the top of the plant, tilt the pot and shake it lightly to coax the plant out. If you notice that the plants’ roots are densely wound around the bottom, gently loosen them apart to break the root memory. This will encourage the roots to grow out into the potting soil instead of continuing in a circular pattern. Don’t worry--you are helping the plant, not hurting it, by loosening its roots. When you plant your annual in the decorative container, make sure the top of the root ball is level with the top of the soil in the container. If you bury it too deep, it can stunt the plant’s growth. Gently press the soil in around the root ball. Repeat steps 8-11 for the rest of your plants. Water the container again. Watering at this stage helps to eliminate any large air pockets in the soil. If you notice after watering that the soil level isn’t even, add a little more potting soil to adjust it. Set your newly potted container in place and enjoy! When you grow Proven Winners annual plants, very little pruning is needed. These plants were selected for their ability to bloom all season without deadheading, or removing the spent flowers. Most varieties produce few to no seeds, which is a benefit since plants stop blooming when they go to set seed. ColorBlaze coleus varieties are very late to bloom or don’t flower at all, so there are few to no flowers to pinch off. If you so desire, you could prune your annual plants a few times per season to shape them. 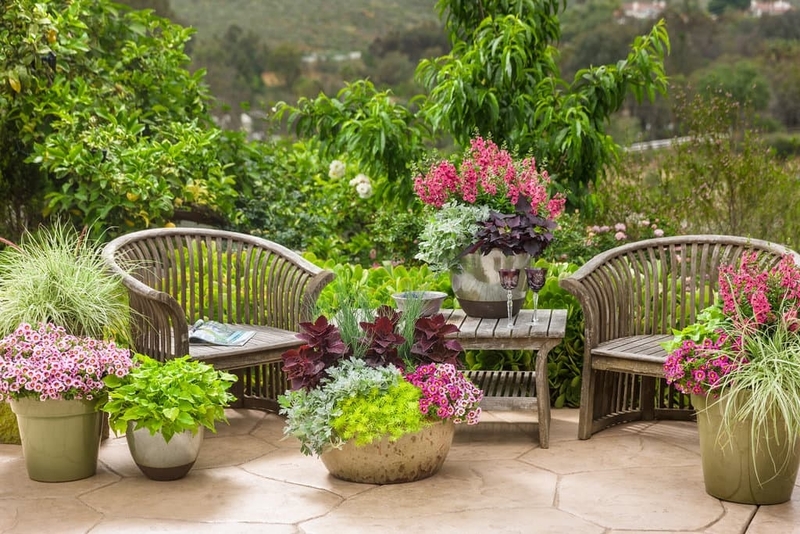 Petunias, calibrachoas, bacopa, polka dot plants, lantana, sweet potato vine, coleus and verbena are all types of annual plants that respond well to shaping. Shape your annual plants by taking a sharp pair of scissors or pruners and clipping off as much as one third of the length of the stems. You could prune them all to be the same length or just trim back the longer ones to come back into line with the rest. When you’re finished, feed the plant with water soluble plant food to encourage a flush of new growth. Hanging baskets and container planters can benefit from a good trimming too. We have a great video to show you exactly how it's done.